4” square x 1/4” wall carbon steel tubular main frame uprights with continuous welds. Where possible, square tubes are rotated 45° and round tube is utilized to help facilitate cleaning of equipment during wash down. 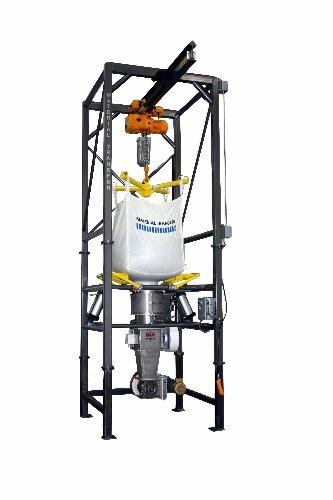 Unit features a 2-ton Harrington electric chain hoist, Spider-Lift™ bulk bag hanging frame, and energy chain package. Equipment is sand blasted, cleaned, primed, and painted with Steel-It™ two-part epoxy. Exclusive Flo-Master™ heavy-duty “breaker-bar” bulk bag massaging system promotes positive material flow. 316 stainless steel bulk bag support pan with welded tubular supports for operator safety. Unit features a 316 stainless steel Flo-Lock™ slide gate system which quickly halts material flow for partial bag discharge. Unit features a 316 stainless steel Seal-Master™ bag spout access chamber with “gull-wing” doors and dust take-off port. Unit features a 316 stainless steel Sure-Seal™ bag spout clamping system for dust-tight discharge. Unit features a 316 stainless steel product discharge transition, including an integrated material crusher and rotary airlock system.